Those words were written to me on Facebook a few days ago by a very dear friend of mine, someone who is also no stranger to struggles with depression. I’ve been thinking of what she said today as the dawn of 2015 draws nearer. The new year is a time to make resolutions and to set goals, and far too often the temptation is there to shoot for the moon and achieve the impossible. The only problem with achieving the impossible, however, is it’s, well, impossible. Moving outside of the realm of depression for a moment, consider one of the most common of New Year’s resolutions – to get in shape and lose weight. When you stop and think about it, that’s a pretty broad goal. It’s also one of the most common to overshoot. It’s simply to large to be taken as a whole. A series of smaller goals, such as resolving to exercise at least 30 minutes every day or not snacking after dinner each night, will eventually add up to achieving the larger one, but they require more discipline and planning and, ultimately, determination. It has been very easy in the past for me to resolve to not be as depressed in the upcoming year. I didn’t have a particular plan mapped out for this; I was just going to do it, the same way someone who wants to get in shape is just going to get up and start cross-training one day. It was really more of a hope than a resolution, because I didn’t even know what I was facing, really. I just knew I didn’t feel good, and I wanted to feel better, so I resolved to do so. I still struggle with that mentality, even after going through a few rounds of cognitive therapy. It’s like my friend said; I want to fix everything all at once. The reality is, though, the road to recovery is made up of numerous small goals along the way. Instead of “I’m not going to be depressed anymore,” why not “I will read at least 30 minutes a day” or “I will sleep at least eight hours a night” or “I will invite at least one friend out for lunch every week”? While none of these may sound very grandiose, they are the building blocks to something more structurally sound. So as I close out 2014, I’ve been compiling a list of smaller goals that I hope will propel me toward larger ones. “Smaller,” however, does not always equal “easier,” which means 2015 could be shaping as a year of great work and effort for me. On the flipside, “great work and effort” don’t necessarily mean I have to figure everything out this year. I wanted to conclude this final post of 2014 with a huge “thank you” to everyone who has stopped by to read what I have written this year. I have questioned the usefulness of what I’m doing here with almost every post, and your views, likes, and comments have been such an encouragement to me. I feel as if we’re all on this journey together, and I pray that all of us are able to progress and grow in 2015. God bless you all. 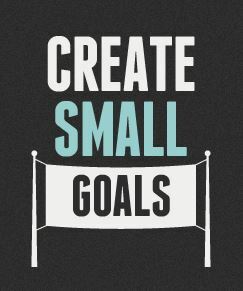 I like the idea of small goals. Big goals tend to be intimidating and overwhelming.